You are great at what you do – this is a given – looking after your clients with as much care as physically possible. The thing is that you also need to give your business that loving care to grow your business and keep the clients knowing about you, what your business offers and be on the front of your potential clients minds. So that when the time is right, they will ring you knowing your business can help them to solve their problem. Here is The Speakers Practice – Daily Marketing Tool for Business Success. 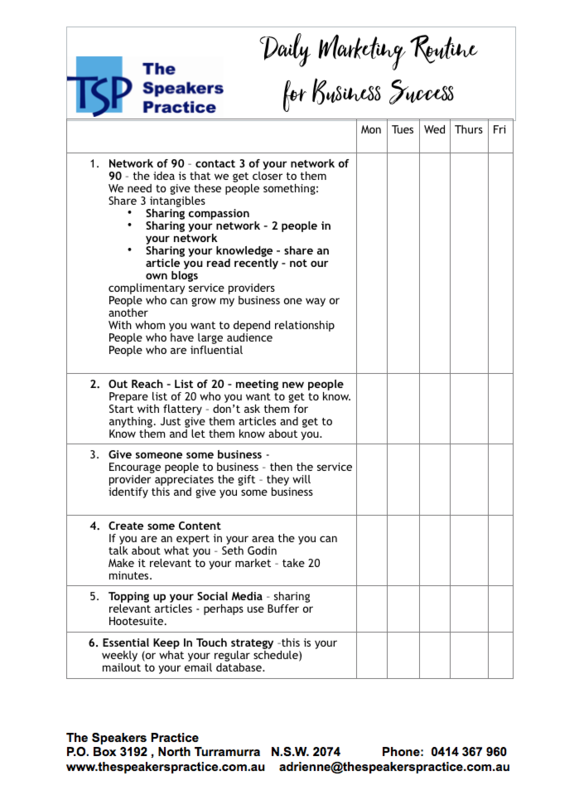 Print it out and just check off the tasks – start to notice the impact your daily marketing routine has on connecting with the people in your database. The Speakers Practice implements the well reknowned international marketing system – BookYourselfSolid® – by following this approach – you will grow your business. 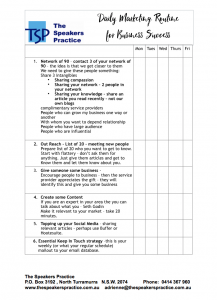 Look at Your network – Create a List of 90 – Look at the people in your network and create a list of people who can grow your business in one way or another. These are people you want to have a business relationship with who may want to do business with you or be able to assist. The list doesn’t need to be made up of solely potential clients, included in the list there may be people who have a large audience and who are influential. Start with flattery – dont ask them for anything. Just allow them to get to know you and then build your connection. By working on each of these steps in The Speakers Practice – Daily Marketing Routine for Business Success , this will grow your connection with your clients. You will find business that will surprise you and you will build the trust with your database that will grow your business. The Speakers Practice offers continuous improvement approaches for small business – we offer Marketing, Public Speaking , Video, Content Marketing, Sales Presentation Skills training and Interview Skills Employment programs.